Northwood's home cross country course is easily one of the most challenging in Montgomery County. Paint Branch's Lorenzo Neil had no intention of pushing the pace but found himself in a competitive pack of four runners for nearly every step of the race. The 5k course mostly consists of hilly, rocky trails with a creek crossing and one particularly brutal hill just beyond the two mile mark. This hill usually separates the men from the boys, but the pack of Lorenzo Neil, Morgan Rivers of Wheaton, Harold Dorsey of Paint Branch, and Binyam Tadesse of Kennedy stuck together. Runners returned to the relatively flat athletic fields behind the high school with roughly 700 meters to the finish line. Still anybody's race, Tadesse made his move, going from fourth to first over a span of 100 meters. Neil responded to Tadesse's surge, creating the first major separation from Dorsey and Rivers. Tadesse pushed the pace for another 200 meters, charged down a steep hill and then ran back up the other side. At the top of the hill, Tadesse said that he suddenly was not feeling well. Neil was just starting to roll. The finish can be a fast 300 meter sprint on Northwood's track and Neil turned it on. He finished in 17:46, just 16 seconds off the course record set last year by Einstein's Nick Simpson. Dorsey passed Tadesse in the final meters to finish three seconds ahead of Tadesse in 17:54. 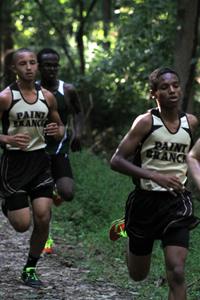 The Paint Branch boys team swept all three opposing teams. The aforementioned brutal hill played a role in the outcome of the girls race. Northwood Freshman Alexis Doon spent the first two miles running in a pack with three Kennedy girls, but as the Kennedy girls slowed on the steep hill, Doon moved into first place. "I didn't sprint ahead," said Doon. "I just kept pacing myself." A steady pace was the key to an easy win in 24:24. She most likely learned that pacing at Lee Middle School where she gained some running experience. Watching the race unfold, Kennedy Coach Dave Warren was hopeful that his girls could pull a 1-2-3 sweep over Northwood to guarantee the team victory, but when Doon emerged the leader, the chances of a team victory were far less certain. Northwood's #2-5 girls were moving in a fairly close pack ahead of Kennedy's #4 runner. In the final 700 meters, Kennedy's #4 runner, Robin Williams, made a move past two Northwood runners to gain the edge in the team scoring. "[Williams] was my MVP today. We are happy we won. Now we have to bridge the gap between the top three girls and the 4-5-6 pack." Kennedy beat Northwood, 26 to 29. Wheaton and Paint Branch did not have complete girls teams. Both the Kennedy and Northwood coaches were mildly displeased that the very first dual meet was so critical to the outcome of the division championship. "Give us Kennedy in three weeks�" Northwood Coach Mike Sauter said, wishing that he had a little more time to prepare his team. 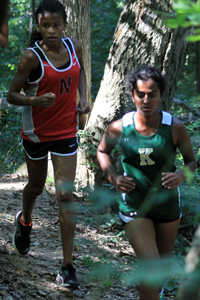 Northwood and Kennedy will not meet again in a divisional meet, but there will be a rematch on the same course at the MCPS Consortia Championships at Northwood on October 13. It was a great team meet with (except for Paint Branch boys blowing everybody out) winning completely dependent on the 4th and 5th runners. Somebody must beat 3 time defending champion Einstein coach Eric Da Silva!